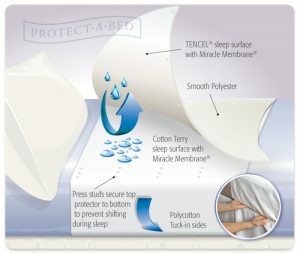 How does the Up and Under Linen & Mattress Protector work? The Up and Under Linen & Mattress Protector is placed over the fitted sheet and tucked in place using the tuck-in sides. The child sleeps on the terry towelling surface and covers him/herself with the attached smooth TENCEL top sheet. The top sheet can be fixed in place over the body using the adjustable-size press studs. This means that your child is sleeping between the two surfaces, creating a barrier between him or her and all other bedding. What is the Up & Under made of? Underneath: a soft, silent and super absorbent natural cotton terry sleep surface, with large draw sheet style tuck-in sides for extra stability. On top: a double sided waterproof cover sheet with smooth polyester on one side and natural hygiene based eucalyptus fibre TENCEL® for a silky soft luxurious feel. Is it noisy or sweaty? No! There is no plastic, rustling noise and no sweatiness with the Up & Under or our range of mattress and pillow protectors (due to the extra soft breathable sleep surface). Why do you suggest purchasing two Up & Under Protectors? We suggest you have two Up & Under Protectors on hand so that you have a second one to use should your child wet the bed midway through the night. Kids often wet the bed twice in one night, and there’s nothing worse than not having a second Up & Under on these occasions. Do I need a fully fitted mattress protector as well as the Up & Under? We recommend using a fully fitted mattress protector along with your Up and Under Linen & Mattress Protector for maximum mattress protection. We stock Single and King Single sized Stay New Terry Mattress Protector as well as the Premium Mattress Protector by market leader Protect A Bed. Can I use the Up & Under with an electric blanket? Yes, the Up and Under Linen & Mattress Protector is safe to use with electric blankets. Can I use the Up & Under with a bed wetting alarm? Yes, it is safe to use the Up and Under Linen & Mattress Protector with your child’s bed wetting alarm. Please read more in blog here. Why don’t you charge GST? The Australian Tax Office classifies our products as health/medical aids, permitting us to sell our products without charging GST. What’s the difference between the Stay New Terry Protector and the Premium Protector? The plush Premium protector has all the features of the Stay New Terry Protector, but it has greater absorbency, is softer and more comfortable and represents the very best quality mattress protector available on the market with a 10 Yr Warranty. Can I return or exchange if I am not satisfied? How is my order packaged and posted? Your products are carefully posted in a durable tough bag or plastic sleeve for in-transit protection and delivered via Australia Post usually between 5 to 10 working days. You can request a tracking number and track your delivery through Australia Post tracking service. We charge a flat fee of $12.00 within Australia. Yes, contact us before submitting your order and we can calculate your postage based on the delivery address. International shipping fees will apply. PayPal where you can also choose to make a Visa, MasterCard or Savings account payment. Please make your selection at the checkout. You are fully protected when shopping online with us as your credit card details are used via the PayPal process and website which is a secured site. Their payment process is heavily encrypted to protect your information. Please allow between 5-10 working days for your order to arrive. I hope we have answered your most frequently asked questions sufficiently, however please feel free to contact us if you have any further queries. We would love to help you on your quest to gain a stress free bed wetting solution for your family.